You may not notice them, but they’re there and they’re keeping us all safe during race weekend. They relay info from the aid stations to the re-stock trucks. They call for rides back to Silver Hill if someone needs a lift. They keep track of the drops and the call for Emergency Services if needed. They are the eyes, ears, and voices of the VT100 that keep us all safe during the event weekend, and they are invaluable members of our team. 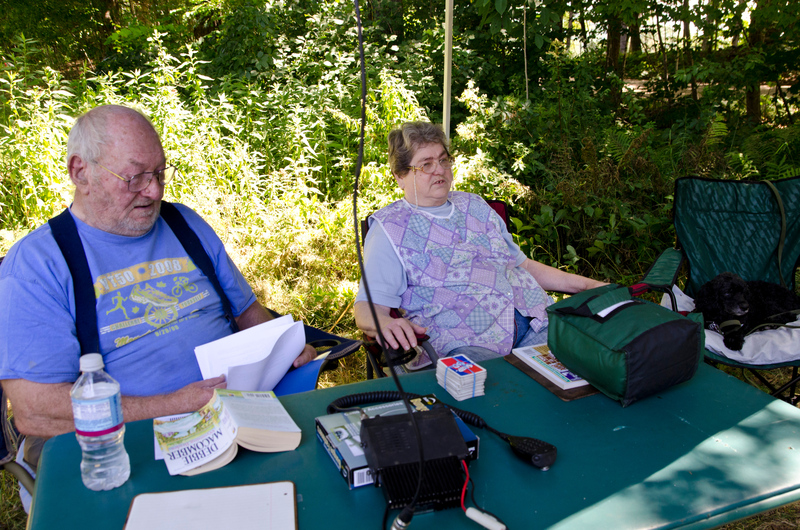 They are our volunteer HAM radio operators, Karen Bailey Mather and Rob Mather. Recently, we caught up Karen and Rob to ask them a couple questions about organizing all the radio crews, and here’s what they had to share! Q. How did you originally get involved with the Vermont 100, as HAM operators at the Aid Stations? Which one(s)? Rob: For the Vermont 100 I have never worked an Aid station, my first year was Net Control. Karen: I was originally a HAM operator at Brown School House. Bob Stewart was having problems filling that spot because it was so remote. He hesitated about having me cover that station until I told him I knew exactly where it was and didn’t mind. Q. Rob, you organize the HAM operators. How long have you done this for the VT100? Do you also train HAM operators? Rob: I started working with Bob Steward early on, he said he had been doing this for almost 20 years and asked me if I would take over for him, it was time for him to retire. I learned a lot about the event, people and Vermont from Bob. Shortly after learning the ins and outs I found a gap with our event starting with the supply trucks. I asked to put radio operators in the supply truck. I was told that there was no room in the trucks for anyone else. I responded with ‘well then, I think you should all get your Amateur Radio licenses.’ Over the next winter I taught an Amateur Radio Technician course for many of the race committee. As I learned more about the event and people behind the Vermont 100 I was drawn to them for their passion. For me it is a passion that I enjoy, mostly the people that have worked so hard for so long to ensure the success of Vermont Adaptive and the Vermont 100. Q. Karen, you seem to be THE Net Control go-to person. Has this always been your main role at VT100? Karen: No, I originally covered Brown School House. Net Control has grown from having a single person at any given time to having 2 people and last year we started adding a 3rd person. It’s really a team effort and having 3 people allows time for breaks and if someone wants the opportunity to either learn Net Control or just observe, there is someone available that can explain the process to them. The races can get pretty hectic at times and there is usually one person that covers the radio and a second that keeps notes on all of the radio traffic. The third person can cover for breaks and answer questions that arise either from radio traffic or people just coming up to the trailer with questions. Q. How did CERT start? Is it a New England thing or country wide? Rob: CERT is federal program under Homeland Security and FEMA, managed by Vermont Dept. of Emergency Management. Q. What are your roles with CERT? Rob: I have been a member, Instructor and have held the role of the Program Director for the Southern Windsor County CERT Team for a few years. Today I am member of the CERT TEAM. Karen: I too have been both a member and Program Director. Q. What is your most favorite memory at the Vermont 100? Karen: I try to be a the finish line when the first few runners come across the finish line. I’m always in awe over how some literally cannot take another step while others look like they could go back and run another 100 miles! Rob: For me it is Sunday morning watching the runners finish their 100-mile trek. For many of these folks their body gave out miles ago however their mind was stronger and allows them to finish. Side note as to why I do what I do: Vermont Adaptive has a special place in my heart, when I was 20 years old I was involved in a serious car accident where I fractured my neck ‘C2.’ I count my blessing every day that I was able to make a full recovery. I could very easily have been a recipient of the services that Vermont Adaptive provides. For this I am grateful. Rob and Karen were married last August after the Vermont 100 and before the Vermont 50. We sure couldn’t do this race without them! Here’s a picture of Polly and Ed. They are originals to the VT100 ever since the race first had radio operators, and we want to make sure they get a nod here too for all the years of amazing service they’ve provided. They typically work at Margaritaville, so be sure to say hi and give a big thank you when you’re cruising in. Remember, you can check out our blog for more VT100 interviews, race info, and lots more!